Move over Robocop, there's a new sheriff in town and his name is ACHIRES. Engineers from the University of Tokyo have created a brand new robot that doesn't just run, it does somersaults too. The 14-centimeters tall, bipedal robot coordinates movement through the use of high-speed cameras and actuators. In a ten-second test run, it actually reached a speed of 2.6 mph. If the tiny robot had been the size of a human, its speed would have been 12.4 mph. The experiment was performed by a Japanese team, led by Profesor Masatoshi Ishikawa. The robot is capable of taking six steps per second and even leans forward when it runs. It maintains balance through a high-speed camera transmitting at 600 frames per second to a nearby computer. 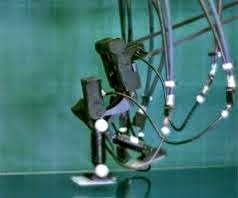 The computer then controls the robot's balance and even issues commands to its actuators. According to researchers, the system enables "instantaneous recognition and behavior." Bipedal robots in the past have depended on what is known as ZPM, or Zero Movement Point, to balance their movement. Such technology is very cumbersome and thus restricts rapid movement. 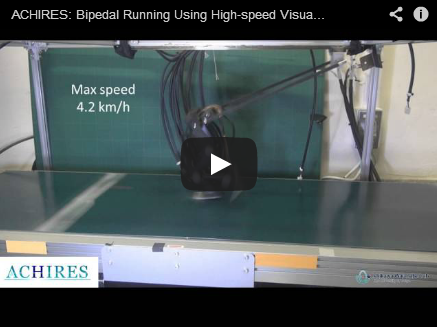 The increased functionality of the ACHIRES (Actively Coordinated High-speed Image-processing Running Experiment System) allows for the robot to actually imitate the way a human runs, leaning forward and pivoting its hips but not losing balance by kicking out against the ground. Even more amazing is that this is the very same research team that created the Janken, a robot capable of beating humans at the rock-paper-scissors game by detecting human hand movements at lightening speed. Besides that, the team says this is just the beginning. Researchers say they will eventually create a robot capable of outrunning humans. And then there was somersaulting. Not to worry. For now, the Olympics has no plans for admitting robots to athletic competition. Robots aren't just for humans anymore. Meet AlphaDog, or LS3, the Boston Dynamics creation that mimics a mule. LS3 stands for Legged Squad Support System and not only can it carry in excess of 100 pound on its back, it goes anywhere a human can. AlphaDog is the new darling of United States Marine Corps. Right now the robot is being tested to carry supplies for soldiers in the field. If all goes well, this space-age pack mule will be able to move at speeds in excess of 20 MPH, all without ever having to refuel, much less needing food, water, or rest. Decent Post what you said is truly useful to me. I can't concur with you any longer. I have been chatting with my companion about, he however it is truly intriguing too. Stay aware of your great work, I would return to you.